Mail & Office File Carts are Easy to Load and Unload! 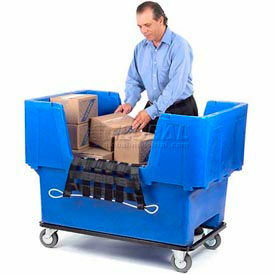 Removable, lift-out baskets make delivery, collection and filing of materials easy and convenient with these mail service carts. The heavy-duty tubular steel construction is chrome plated for long life. Includes rails for hanging letter or legal files. Some models with foam grip comfort cushion handles. Easy assembly. Steel File Carts Keep Important Files And Documents Close At Hand. Made using durable steel. Top viewing design allows easy filing and retrieval to stored documents. Holds letter size hanging files. Moves easily on swivel casters (2 locking). Greenguard certified. Shipped fully assembled, except for casters. Economy Carts feature a full width piano hinged lid for access to files. All other carts include a locking lid that slides behind the unit for access to files. Lock includes 2 keys for security. All file carts, except File Carts with Drawer, have a bottom shelf for added storage space. 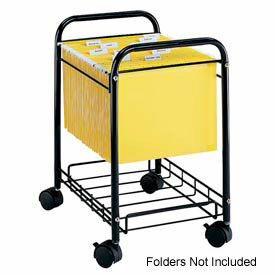 File Cart with Drawer includes a full suspension file drawer with lock and 2 keys. Sloped Shelves On These Book Trucks Securely Store And Transport Books, Magazines, Binders And Other Literature. 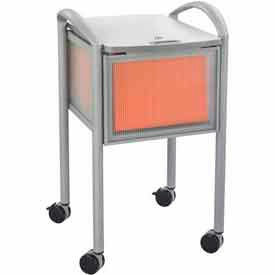 Book carts are made of welded steel with powder coat finish for strength. Book transport carts features 3 sloped shelves with 12" shelf clearance. Framing offers tubular push handles for easy steering. Moves easily on 5" rubber swivel casters with brakes. Powder coat finish is available in 9 different color options. Available in three sizes. 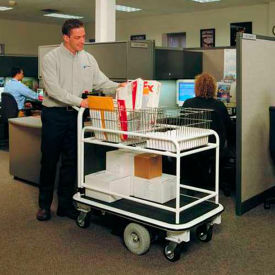 Mobile File Carts Offer Functional And Versatile Office File Storage And Transport Solutions. 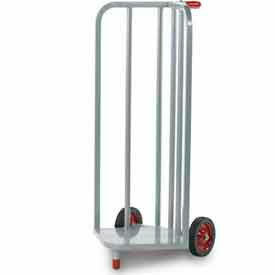 Mobile File Carts are made of sturdy steel construction for long lasting durability and dependability. Contemporary styled Perforated Panel with Steel Frame type units are available in various open top types, including units with Bottom Shelves and End Document Pockets for storing active files. Easily Store And Transport Books, Magazines And More Using This Sloped Shelf Book Truck. 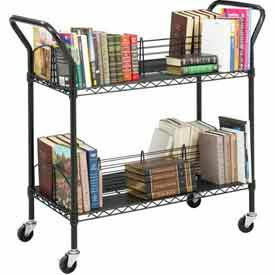 Book cart is made of welded steel for strength. 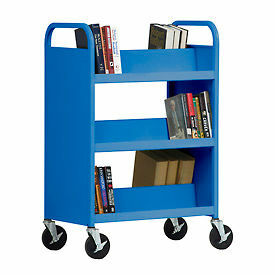 Book transport cart features 6 sloped shelves (3 on each side). Each shelf has 12" clearance. Framing offers tubular push handles for easy steering. Moves easily on 5" rubber swivel casters with brakes. Powder coat finish is available in 9 different color options. Used for Pickup and Distribution of Mail, Folders, Parts and Tools. 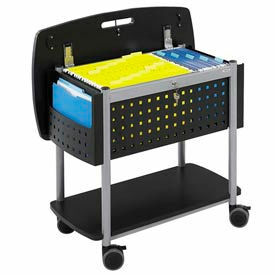 Safco® Book Carts Are Available In Various Single Or Double Sided Designs. 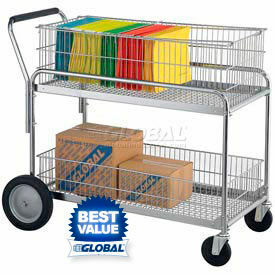 Safco® Book Carts are made of sturdy steel construction for long lasting durability and dependability. Various styles include traditional sand color Solid or contemporary black Perforated side panels. Single or Double sided 3 tier units feature slanted shelves with retaining lip edges to secure cargo during transport. 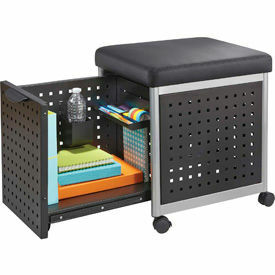 Scoot™ 3 Shelf Utility Cart with perforated side panel design also available. All carts move easily on swivel casters. Dimensions vary per model. Single-Sided Book Cart includes 3 slanted shelves that measure 12-1/2"D x 12-1/4"H.
Double-Sided Book Cart includes 6 slanted shelves that are 8"D. This cart includes a height adjustable file pocket. 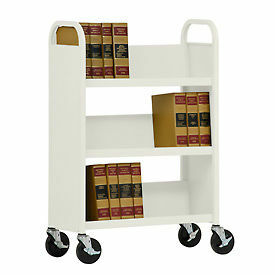 Store And Transport Books, Magazines And More With Ease Using This Sloped Shelf Book Truck. 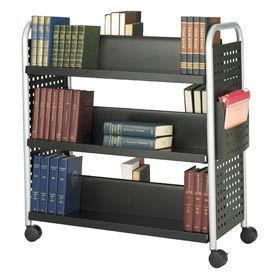 Book cart is made of welded steel for strength. 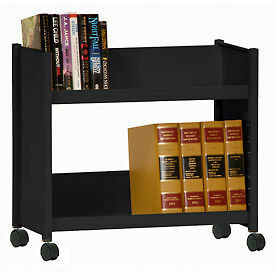 Book transport cart features two sloped shelves for secure storage of books and other literature. Book truck offers 13-1/2" clearance between each shelf. Moves easily on 4" rubber swivel casters. Powder coat finish is available in 9 different color options. 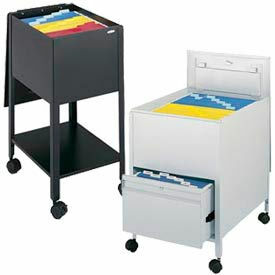 Wire File Carts Are Used For Active Project Filing By Desk Or Workstation. Wire File Carts are made using durable wire shelves that are reinforced with a truss perimeter for extra strength and stability. Tucks neatly under work surfaces when not in use. Top perimeter shelf accommodates letter and legal size hanging folders. Moves easily on swivel casters. Easy assembly. Dimensions vary per model. 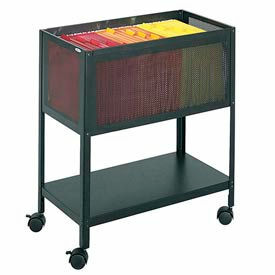 The economics of this Wire Book Cart will show off all your book smarts! The double-sided Wire Book Cart has four slanted 8"D x 35"W shelves, perfect for transporting all your books and reference materials. And you'll see all the beauty of your books with the attractive, durable all steel post construction and welded wire shelves. The cart rolls smoothly on four 3" swivel casters (2 locking) for easy transportation. Each 36" x 18-1/2" shelf adjusts in 1" increments to accommodate larger materials and has a black shelf liner. Each cart has a capacity of 200 lbs. (100 lbs. per shelf). Easy assembly instructions included. 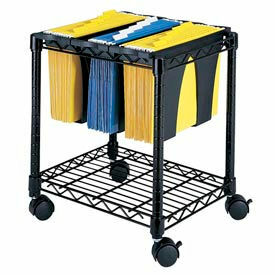 Safco® Wire Mobile File Carts Provide Mobile Storage For Hanging Folders For Offices, Laboratories, Warehouses And More. 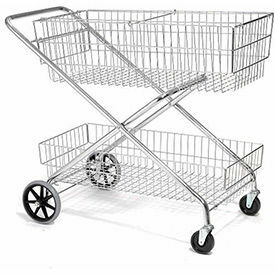 Safco® Wire Mobile File Carts are made of sturdy steel construction for long lasting durability and dependability. Various 1 or 2 tier styles available for letter or legal sized files. All carts move easily on swivel casters or easy mobility and rearranging. Single tier carts easily slide under work surface to open up floor space. Choose Black or Metallic Gray color. 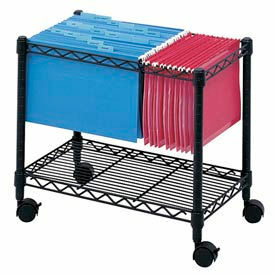 Safco® Onyx™ Mesh Open File with Drawers that organizes hanging files and other office supplies also available. Dimensions vary per model. Designed principally for moving books but easily handles CDs, video tapes and more. The generous size base enables effortless handling of large report binders. Rugged tubular steel construction offers years of service. A must for every school, library, church and law office. Project File Cart Makes Organizing And Transporting Files Easy. Convenient desk-side filing system easily stores under a work surface to free space and keep files close at hand. Accommodates letter or legal size folders. Sturdy 3/4" tubular steel frame includes wire support rails for filing. Includes lower wire shelf with raised lip edges for added storage space. Rolls easily on 4 swivel casters (2 locking). Flat Shelves On This Mail Cart Store And Transport Books, Magazines, Binders And Other Literature. Cart is used for delivering Mail and Small Packages. 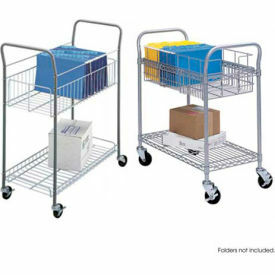 This cart features two 20"L x 17-½"W x 10"H wire baskets to make collection, filing and delivery of mail throughout your facility easy and convenient. Shelves feature a 1" deep lip around the perimeter of the shelf to retain the baskets while in motion. Each basket includes two file folder hanger runners that are adjustable for letter or legal size hanging files. Rolls smoothly on 4" x 1-¼" polyurethane swivel casters, 2 with brakes. Durable steel construction and assembles easily. 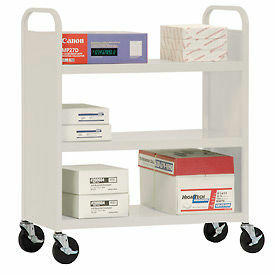 Safco® Impromptu® Mobile File Carts And Storage Centers Are Used For Offices, Schools, Medical Facilities And More. Safco® Impromptu® Mobile File Carts And Storage Centers are made with sturdy steel frames with powder coat finish for lasting durability and dependability. Translucent polycarbonate side panels allow easy visibility of contents. 2-1/2 inch diameter swivel casters (2 with brakes) provide easy mobility. File Carts hold letter-size folders and are available with Open Top or Locking Top models. Curved handles provide a distinctive modern look. Storage Centers come with Cherry or Gray melamine laminate tops and lockable doors. Fit under desktop to keep active projects within easy reach. Convenient bin for hot files, filing to-do or collecting daily paper recycling. Available with or without Hanging File feature. Dimensions vary per type and model. Limited Time SALE Save up to 20% on select models. Electro Kinetic Technologies Pony Express Motorized Mail Room Cart Provides Motorized Transportation For Mail And Packages In Office, Commercial, Warehouse Environments And More. 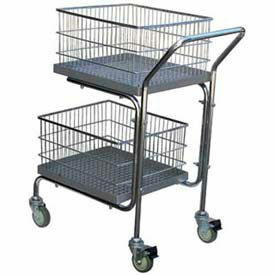 Electro Kinetic Technologies Pony Express Motorized Mail Room Cart is made of welded tubular steel for long lasting durability. Motorized mail carts eliminate employee injuries due to excessive pushing and pulling. Deep cycle AGM rechargeable batteries and never-flat drive tires provide minimal maintenance. Solid state regenerative breaking and holding brake maintain positions on inclines and provide additional employee safety and security. Full wrap around vinyl bumpers provide protection to cart and surrounds. Ergonomic handle control provides variable speeds. Keyed power on/off switch can be removed for security. Weight capacity is 1500 lbs. Maximum travel speed is 3 mph. Wire your message or mail it! Durable and easy to use, this cart features welded wire construction with convenient dual handles, a top basket designed to hold up to 75 legal file folders (not included) and a bottom shelf that accommodates parcels to make your mail distribution more efficient. Experience smooth movement on 4" swivel casters, 2 locking. 600 lb. weight capacity. Includes a Limited Lifetime Warranty.